Keeping my kiddies safe from the sun has been important to me from day one. Since I’m in charge of protecting their skin from the harm the sun can do it’s something I’ve always taken seriously. If we are going to be out and about I always try to pack a hat and sunglasses, as well as sun cream. Luckily these past few months the hat and sunglasses have become more like fashion accessories to Amy and so don’t require much reminding on my part. The sun cream is my responsibility to always have on hand, so I try ensure I always have one available in our nappy bag. 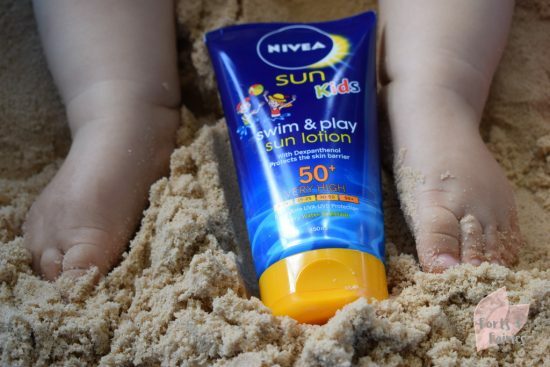 The NIVEA Sun Kids Swim & Play Sun Lotion is a solid choice in my opinion. It’s small enough to pop in your bag, but not that big that it’s going to take up too much space. Priced at R164.99 for 150ml it will also give you some bang for your buck, and your kids will like the look of it with its cheerful blue packaging featuring two kiddies playing with a ball in the water. At SPF 50+ you can trust that this lotion will offer the maximum protection from the sun, and because it’s water resistant they can enjoy dashing through that sprinkler on a warm morning or splashing with their flippers in the pool too. The lotion itself has a nice smell, a familiar one that reminds me of sandy days on the beach or lounging by the pool. It’s easily absorbed and doesn’t leave any white residue after a few rubs. It’s also non-greasy and not very sticky. As mentioned the packaging is attractive, making my little girl happy to run and fetch it before school to apply the sun lotion before the day starts. Bottom line: The NIVEA Sun Kids Swim & Play Sun Lotion 150ml will last you a decent time and is a valuable investment in protecting your children against the harmful rays of the sun. NIVEA is a brand we all know and can trust, so I don’t hesitate to recommend this sun lotion to other families. Additional information: The NIVEA Sun children’s products are suitable for one year or older. Please remember that even though you use sun lotion on your children they should still stay out of the sun during peak hours, and also make use of hats and sunglasses as much as possible. They should also apply the sun lotion before going in the sun and reapply it often, especially if they’re getting wet. Thanks to NIVEA for the opportunity to review this product, and for reminding us to get our toes sandy and have fun in the sun safely.